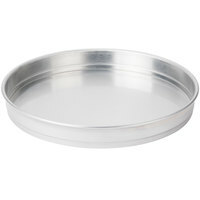 Bake your cakes, desserts, or deep dish pizzas in this 16" x 2" round aluminum pan. Always bake to perfection with this 16" x 2" aluminum pan. Designed for durability and consistently pristine results, it is the ideal pan for a variety of dishes, from deep dish pizzas to a layer of wedding cake. Whether you operate a bakery, pizza shop, cafe, or family restaurant, this reliable cake pan is a must-have addition to any business! 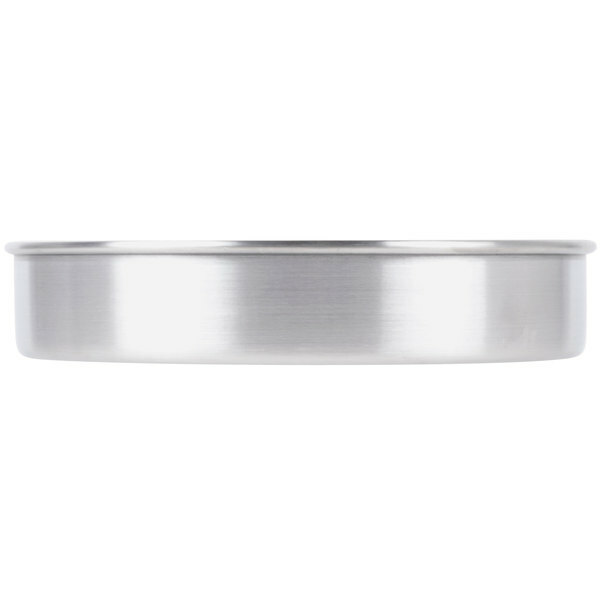 "I was very nervous about buying this pan for wedding cakes, since I had only used "name brand" pans. I took a chance on this one, and I'm glad I did. The cake did not stick, and the cake baked evenly. 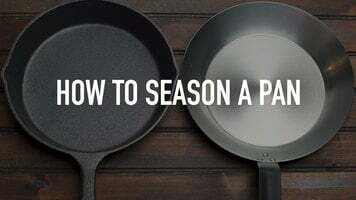 I love this pan." 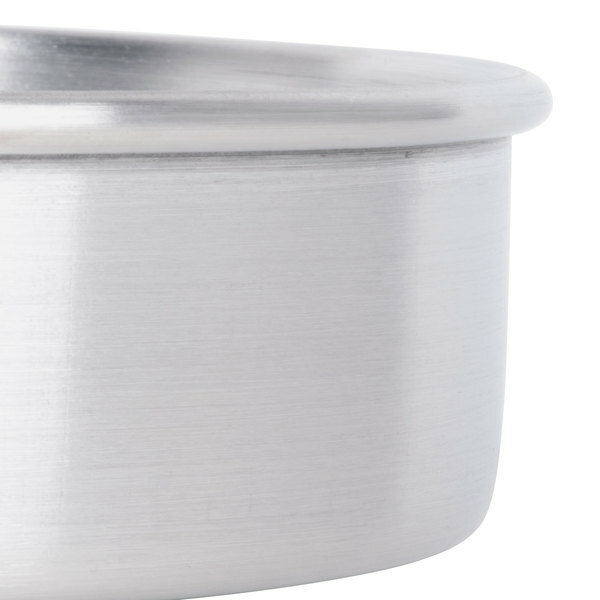 Avoid producing burnt or undercooked foods by using this pan. Thanks to its reliable aluminum construction, it evenly distributes heat to yield the delicious cakes and pizzas you demand! 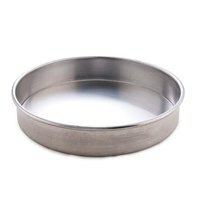 At 16" x 2", this round pan's versatile size is perfect for cooking deep dish pizzas, cake layers, and a variety of other tasty treats! Made of durable 19 gauge aluminum, this pan firmly supports your entrees or desserts during preparation and baking. 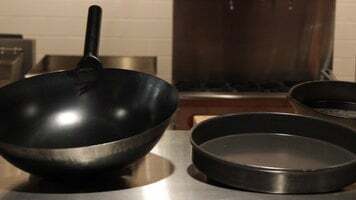 We love all these Choice pans from webstaurant, so many choices to choose from to help in every station, these 16 inch work great for our big catered events too. These are a great priced pan. Heats evenly. Cakes release pretty easily. The reason for the 3 stars: the packaging and shipping is not up to par. At least 1/3 of the pans ordered came in damaged from their packing procedures- Literally just thrown in a box and sent on their way. I had several that were completely unusable. That was disappointing. Thank you for your feedback! We are sorry your 16 inch x 2 inch Round Aluminum Cake Pan / Deep Dish Pizza Pan was defective. Corrective action has been taken and a Customer Solutions Representative has credited your account. This pan was perfect for a cake I needed! It baked evenly and edges were crisp! Thank you again for another great product! Never disappointed in my purchases! 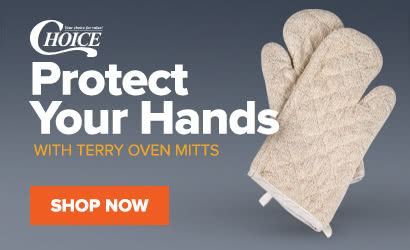 They bake evenly and are very durable. They make baking cakes worry and stress free since we know that there won't be unbaked portions of the cake. Worth the buy. Pan worked great! Needed it for a wedding cake and took a chance on it. I'm so glad I did. Price was great, shipping was fast. Would order again. 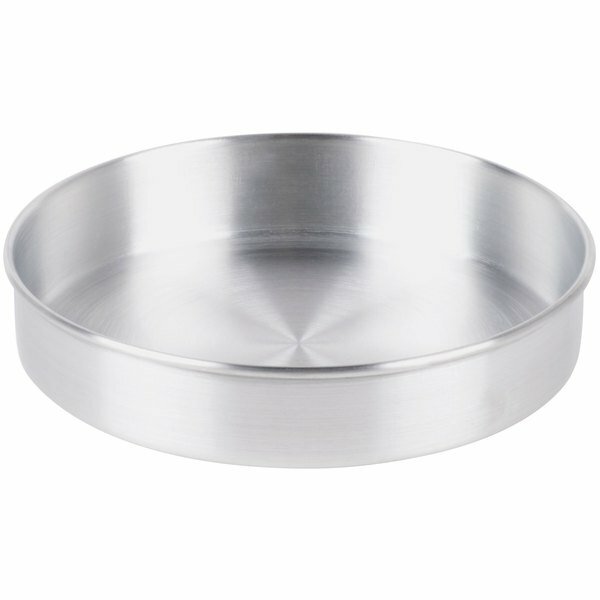 We love using every size of these cake pans for our bakery. We get a lot of cake orders that always range in size so it's great to have such a selection. They bake evenly and the cakes pull from the sides well. This pan is perfect for an extra large cake. This pan worked great. 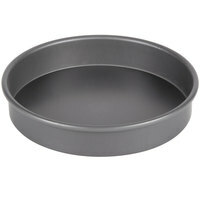 I used this pan to bake several layers for a baby shower cake that I made for my friend's baby shower. The cake layers came out beautiful and even. Will definitely continue to buy products from here. Nice quality pan and very good price. Have had these for about 6 months and they are holding up very well with daily use and washing in the sanitizer. This is good for a big cake layer, giant cookie, or pizza. It is lightweight though sturdy. I have them in all the available sizes. 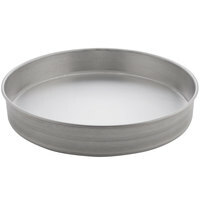 This is a great 16" pan that produces nice cakes with perfectly straight sides. It's durable, and washes up nicely too. I've been very happy with it so far. This pan is not as sturdy as I would like. It came with a dent and was warped from shipping. If it is like the smaller pans from this brand than I am sure it will do the job when we get around to using it. 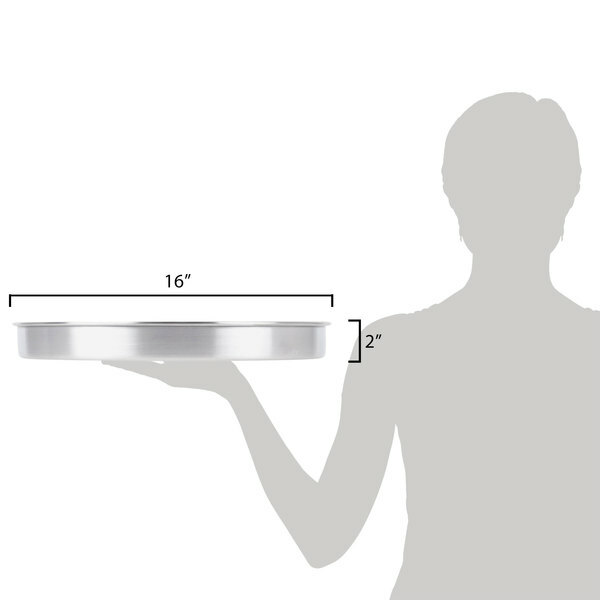 Ordered the 16" x 2" cake pan. The order came in fast. Good size cake pan. Only con is that the pan is thin and not as sturdy compared to the 12" and 10" that I also ordered. But overall, still useable. Had to order these for a custom wedding cake. The quality is great and the cakes baked up perfectly. I would definitely recommend these to anyone. I was very nervous about buying this pan for wedding cakes, since I had only used "name brand" pans. I took a chance on this one, and I'm glad I did. The cake did not stick, and the cake baked evenly. I love this pan. Nice item, useable for my wedding/birthday cakes. Perfectly slanted sides, bakes evenly and cleans evenly. 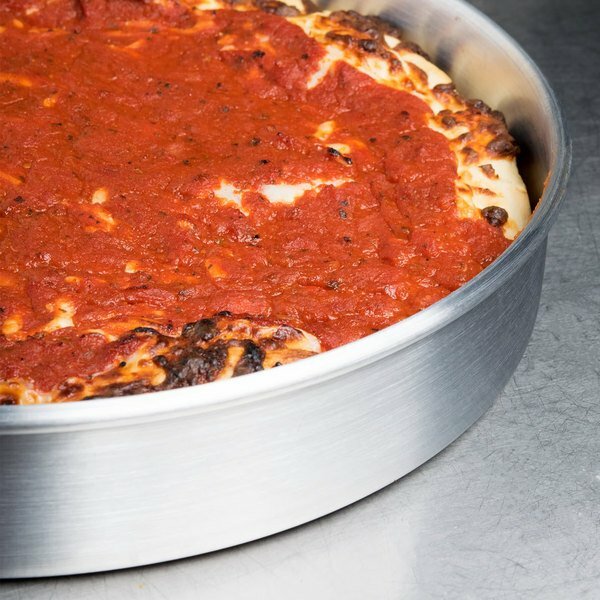 Have no tried for baking pizzas on but seems that it would make a good 2 person deep dish pizza. 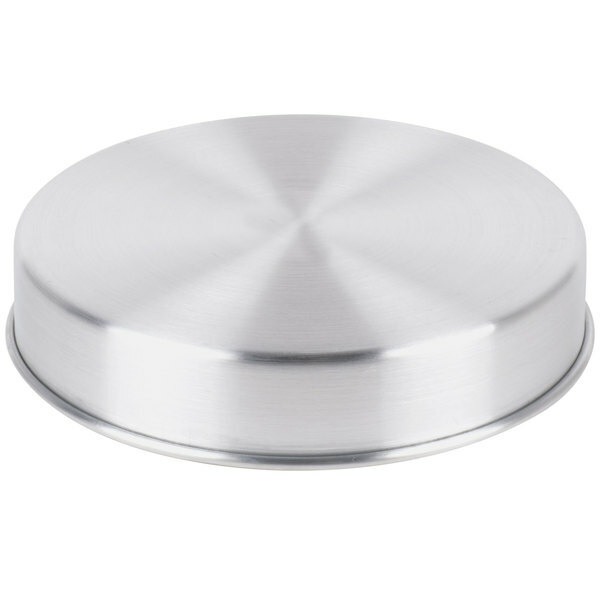 Love these pans the cakes bake up perfectly every time and they are as easy as ever to remove from the pans as well. I almost never need to level my cakes anymore, such a time saver. I will be buying these for as long as they are available. These are great! I love having these in the bake shop. I like using the 2 inch over a 4 or 6 because the cake comes out much easier. Nice big pans. I ordered a set of six and one was warped. I dealt with it. Didn't bother contacting the seller. They are nice quality though. Bakes nice. 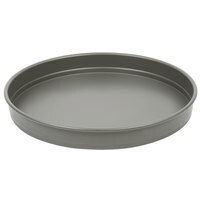 The 16"x 2' Round Aluminum Cake Pan / Deep dish pan. We use two pans each time we get an order for a 16'cake round cake.They work great and don,t stick. It's very good item. I used it,and I like it.I like the materials it made.and I think I goin to buy more items in this store. so far I have not used this pan. However, if it is anything like my 12", I will be very pleased. It appear to be of good quality metal, the 12" bakes very even and everyone comments on how moist the cake is throughout. No dry spots or soft spots anywhere.